This Nordlys Ellipse IPL laser effectively treats a wide variety of skin conditions, including unsightly Acne, by using a combination of fractional and infrared lasers in one device that can cover both small and large areas of the body. Birmingham AMAE Med Spa is one of the few facilities in Oakland County to offer this fast, comfortable, affordable, high-tech laser skin care treatment. In this article we discuss how the Nordlys Ellipse IPL laser treats Acne. 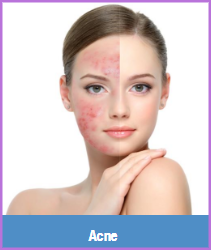 Ellipse IPL Laser Acne Treatments can help you obtain a beautiful, clearer complexion without the use of antibiotics or harsh topical chemicals and creams. Acne occurs when the oily secretion of the sebaceous glands (sebum) is unable to leave the skin because a hair follicle is blocked. As a result, bacteria grows beneath the surface of the skin, causing inflammation and ugly pimples. Rupture of an inflamed area can lead to permanent scarring. Ellipse Selective Waveband Technology (SWT®) laser treatments have been clinically proven to speed up the healing process for acne. It works by reducing the blood supply to the sebaceous gland, which slows the production of sebum, allowing healing process for acne to accelerate. More specifically, the Ellipse laser acne treatment directs pulses of specific light frequencies into the skin (epidermis). This light is absorbed by the hemoglobin in the blood vessels that feed the sebaceous glands. When the Hemoglobin converts the light energy into heat, it damages the walls of the vessels supplying blood to the glands. Birmingham double board certified plastic surgeon Dr. Ali offers the absolute best, state-of-the-art technologies in skin treatments, and acne reduction. In addition to Nordlys Ellipse IPL laser skin treatments, we also offer Fraxel 1550 laser treatments as well as ThermiSmooth radio frequency skin treatments. Each laser skin treatment begins with a professional skin consultation. Treatments are selected and optimized to meet the specific needs of each client with the most innovative and comprehensive products and technologies. For optimal results we also offer custom packages of laser treatments, under the guidance of medical aesthetician Ramona. Schedule a laser Acne treatment – and then relax in our Birmingham Med Spa, while we make you look and feel more confident and attractive!